…or…"How I really don’t like Brancott Pinot Noir" by tami h.
***Editor’s note: This entry could also be called "An uninspired photo for an uninspiring wine". New Zealand Sauvignon Blancs are some of my mostest favoritest wines in the whole world. Nothing makes me want to throw some wine back than that cat pee and grass and citrus smell that only the swooniest SavB’s have. Dyed in the Wool…Kim Crawford…and Brancott are three of the most readily available and reasonably priced around. So..when the thought of branching out to a NZ red came along..the idea excited me – this edition of Wine Blogging Wednesday (graciously hosted by CorkDork) To be honest, when I buy red wine, I think of every wine-making country except New Zealand. 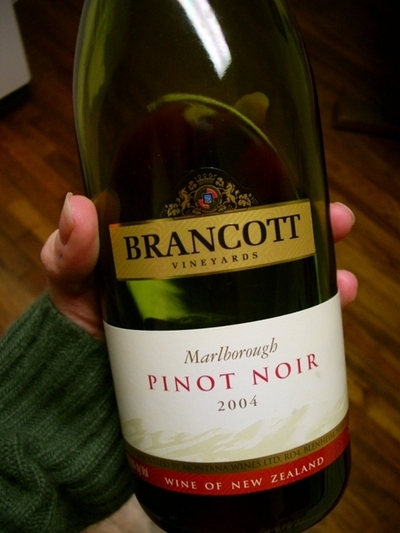 Since the choices here in the ATL aren’t bountiful, I bought – after much searching – a bottle of Brancott Pinot Noir. The SavB is good…the Pinot can’t be far behind, right? I poured myself a glass of it…and immediately went to look up the tasting notes online. Blackberry? Tannins? Oak and spice? MEDIUM LONG FINISH!? Wha wha wha!?! I went into the kitchen and looked at the bottle again. Yep. Same wine. Crap. All I tasted was cherry. Not even big yummy cherry. I tasted semi big half hearted cherry. No spice. No zing. No depth. Hardly any color. It looked like cherry Kool-Aid….but with alcohol…sort of. I chugged my two glasses (Hay! I had to have another glass for the sake of thorough research, right?!) and called it a night. The best thing I can say about it was it kept me sipping through regulation time of the Orange Bowl and provided me with a good night of red wine sleep. My o My you taste it,:O Its really so delicious.Red wine of any kind must be awesome in taste.